It’s Been Quite a Journey So Far, My Love! I want to wish a Happy 22nd Anniversary* to my husband and best friend! Words can’t express how much I love you but I wanted to tell you (and I will, don’t worry…you won’t have to just read it here on my blog!) how much I appreciate you and thank my lucky stars that we not only got together (after much stalking on my behalf), but STAYED together after all these years. I am proud to tell people that we have the special kind of relationship that beats the odds, especially the slim chances that young marrieds (as we were, at just-turned-eighteen and almost-twenty) have. One of my fave photos EVER. 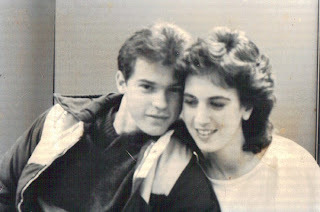 Jim & Melisa, Spring 1985. Between classes in the hallway of FHS. Photo by Julie Sudman**. Jim was 18, I was 16 1/2: the current age of our older son. UGH! Through thick and thin, sickness and health, richer and poorer, in good times and in bad, I am yours forever, faithfully. 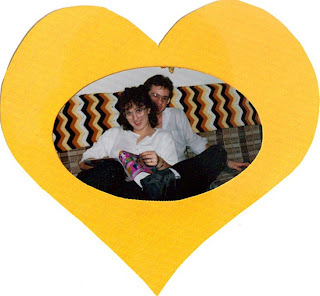 Melisa & Jim, December 29 1986. This is the *only* photo of the two of us on our actual wedding day. And yes, I’m reading “Teen” magazine. **Julie was one of my classmates: she took it for her Photography class! Julie: if you google yourself and find this, drop me a line!*. Congrats! 22 years is awesome and something to be proud of! I love that you married young and it stuck! (we were 20 and 23 and it’s been 16 yrs.) Do you have special romantic plans for the evening? If not would you like to do those drinks I owe you? (all 4 of us?). As someone who married her high school swetheart and the marriage didn’t last, I can tell you that 22 years is amazing…and something you should be very proud of. And I love that picture of you and Jim, too! Happy Anniversary, here’s to 22 more just like it! Congrats! I hope you have many, many more. Awww happy anniversary! I was trying to figure out how you’d possibly been married that long (you don’t want to know what I was doing in 1986), but just turned 18 makes sense. Congrats and keep it up! Oh and I meant to ask… how does the older bro take it that his younger bro gets the cell at so much a younger age than he did? Happy Anniversary – may there be far more than 22 more! Its hard to figure out where to start. I guess I’ll start with; thanks for stalking me. It turned out better than I could have hoped although I cant tell you where 22 years went, seems like 4 or 5, maybe 10 at the most. Seesm like just yesterday we were setting up our first home together in Va and now, all of the sudden we have two teenagers! What happened. Well anyway, I just want you to know that I would only change one thing had I to do it all over again, I would have done things right in the beginning and given you a proper wedding and all of that. Maybe I can fix that soon, who knows. 25 is coming up soon! Love you more than anything. Sarah: Aww, you Newlywed, you! 🙂 Someday I’ll bore you with the secrets to a successful marriage. But I bet you know them already. Jim: You’re welcome. Stalking you was totally my pleasure. 🙂 Love you MORE. Love the pictures! You two just look so perfect together – then AND now! awww your hubby’s comment was sooo sweet it almost made me cry! and i don’t even like all that mushy stuff usually! congrats on doing what most people can’t (work on a marriage, when did they become disposable?? )hope you have many more! O-M-G! That is beautiful. I barely know anyone who has persevered and flourished in marriage. Happy Anniversary, you two. You’re totally inspirational to me 🙂 And sweetest ever comment from a husband I have ever seen. Huckdoll: Thanks. 🙂 I agree; he is very sweet. Next post: Can’t Decide What To Drink on NYE? I Suggest The Ones With The Coolest Labels.